TRENTON, New Jersey, January 25, 2011 (ENS) – New Jersey has negotiated removal of three dams on the Raritan River as compensation to the public for harm to natural resources from pollution at a refinery and three polymer plants operated by or affiliated with the Houston-based El Paso Corporation. Department of Environmental Protection Commissioner Bob Martin announced today that El Paso will finance and carry out removal of the dams under a settlement agreement between the state and the company. The dam removals will open a 10-mile stretch of the river to fish migrations for the first time in more than a century and expand recreational opportunities along the river. None of the dams were built for flood control. “This unique and unprecedented settlement will make valuable habitat in the Raritan River available for fish spawning while improving overall environmental conditions in the river system,” Commissioner Martin said. “In addition, dam removal will make it easier for kayakers, canoeists, and other lovers of the outdoors to enjoy a river system that has been undergoing a steady and impressive ecological comeback over the years,” Martin said. Dam removal will open up a stretch of the river that winds through a diverse residential, commercial and agricultural portion of Somerset County that includes Bridgewater, Bound Brook, Somerville and Manville. It will also open up about 17 miles of Raritan tributaries to spawning. The Robert Street Dam, a 6.5-foot-high sheet piling and concrete dam located at river mile 27.9 and built before 1930 for purposes that are not known today. 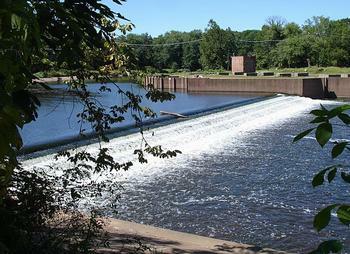 The company is expected to launch the project this summer with the removal of the Calco Dam. The Island Farm wier, a dam located between the Calco and Nevius dams and constructed in the 1990s for the Elizabethtown Water Co. and the New Jersey Water Supply Authority, is not affected by the agreement with El Paso. A large fish ladder in operation at this dam is monitored by the DEP’s Division of Fish and Wildlife. The fish that will benefit most from the dam removal are American shad, striped bass, American eel and herring. Each of these species once spawned in large numbers in the gravelly shallows of the upper Raritan. Striped bass and shad are important species to recreational fishers. Herring and eel are important food sources for other species in the ocean and estuaries, including game species such as striped bass, weakfish and bluefish. Better water flow in the river will also improve flushing of sediments, reduce nutrient loadings and improve conditions for tiny aquatic organisms that are critical to the food web in any river system, Cradic said. El Paso approached the Department of Environmental Protection several years ago to cooperatively resolve its natural resource damage liability. Natural resource camage claims seek to restore natural resources such as wetlands or groundwater and compensate the public for the amount of time the resources were harmed by pollution. The settlement resolves natural resource damage claims by the DEP against the company that stem from contamination at EPEC Polymers Inc in Flemington, Hunterdon County; Nuodex Inc. in Woodbridge, Middlesex County; EPEC Polymers Inc. in Burlington City, Burlington County; and the Eagle Point Refinery in West Deptford, Gloucester County. Investigations and/or cleanups are under way at those sites. The Flemington and Woodbridge polymer facilities are located in the Raritan’s watershed. The Eagle Point refinery, which El Paso once owned, and the Burlington County polymer facility are located in the Delaware River watershed. El Paso has agreed to provide the DEP $156,655 for a migratory fish study for the Delaware watershed. The DEP will continue working with El Paso as the company designs and implements the project. The company has completed engineering studies and is expected to soon file for dam safety, land use and other DEP permits. The settlement marks a first step in what the DEP hopes will become an even broader effort to enhance fish passage or remove additional dams in the Raritan and its tributaries, including the Millstone River.